This exciting day tour will take you on a trip along the southern coastline of Iceland. See some of the most dramatic scenery in Iceland with beautiful waterfalls, black sand beaches, glaciers and volcanoes. The south coast of Iceland is a popular destination with many different sights that top everyone's bucket list. Experience the tremendous beauty of waterfalls, black sand beaches and glaciers. In a single day you can get close to the raw nature as you experience the best Iceland has to offer. 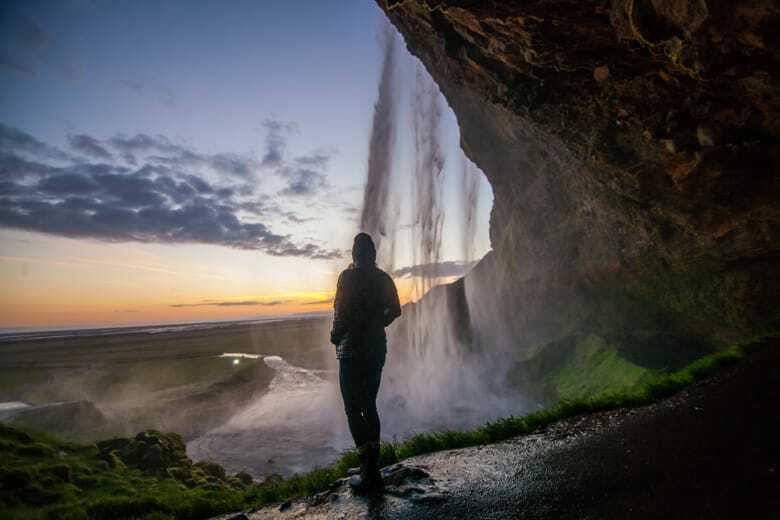 Walk behind the thundering veil of water at Seljalandsfoss waterfall and take in the incredible views from the top of Skógar Waterfall. 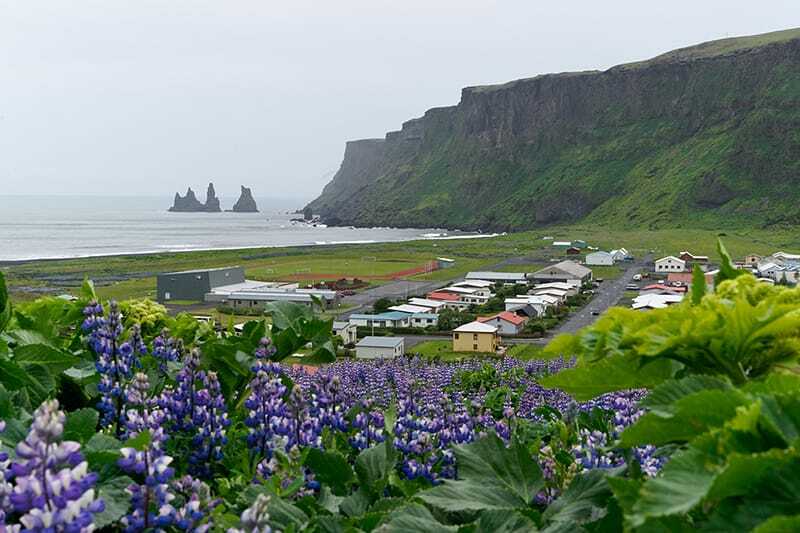 Step onto the dramatic black sand beach at Reynisfjara and visit the charming village of Vík. Seljalandsfoss is one of the most popular waterfalls in Iceland and for a good reason. Being able to admire it from the outside is great but what makes Seljalandsfoss unique is that you can walk behind it. This 60 meter (200 ft) tall waterfall has a walking path that is accessible by most people. Just be careful as it might get slippery. As you get closer to the waterfall you start feeling the mist coming from it as it falls into a small lagoon. Once you are behind it you really feel the powerful force of the glacier river as it falls down right in front of you. The waterfall originates in Eyjafjallajökull glacier, Icelands most famous volcano. Standing behind this waterfall is a magnificent experience and has made it a popular spot for proposals. Some say that the waterfall is even more beautiful during night time as strong beacons of light highlight it's beauty. We encourage people to wear waterproof clothing as it's highly likely that the water will get you a bit wet. During winter months the walking path isn't always open as there is risk of ice falling down. 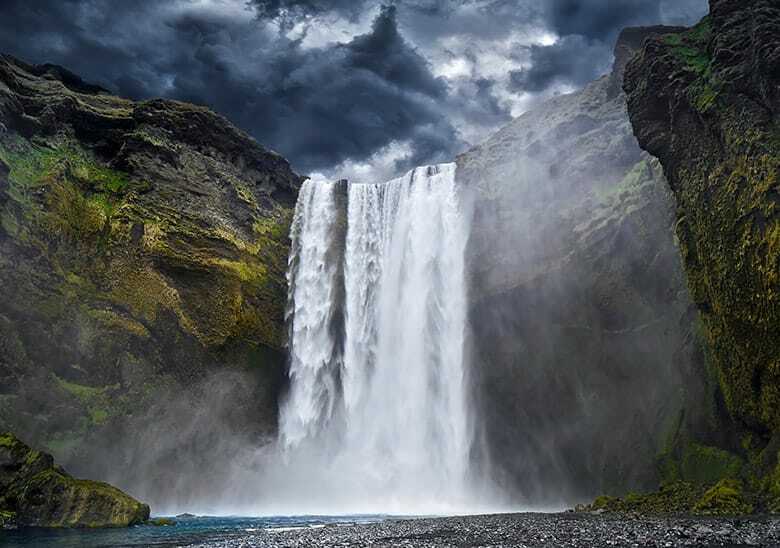 Skógafoss is one of the largest waterfalls in Iceland standing at 60 meters high (200 ft) and 25 meters wide. It's a classic waterfall that falls directly down from the highlands before the river leads to the ocean. Skógafoss is frequently home to a magical double rainbow due to the amount of mist that rises up from this powerful beauty. You can walk quite close to the waterfall, as you get closer you feel the mist all around you and your camera lens start to get a bit blurred. The power and magnitude as this close range makes you feel quite close to the Icelandic nature. Next to the waterfall is a staircase that takes you to the top of the waterfall where a great scenic deck gives you a birds eye view of the waterfall. Take a moment to enjoy the soothing sounds of the glacier river and enjoy the view of mountains and the neighbouring country side. From the top is also the starting point to the famous Fimmvörðuháls treck that leads to Þórsmörk. This is probably Icelands most popular hiking destinations known for it's nature and beauty. There are few places in Iceland that are quite as popular and picturesque as the black sand beach Reynisfjara. 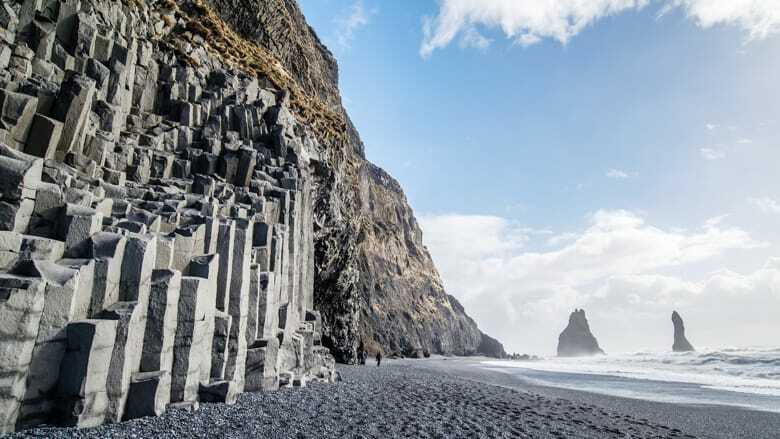 This dramatic beach contains large pillars of basalt columns on the side of Reynisfjall. These stacks are popular amongst young and the old to climb and play around in. A little but further up you might see puffins flying around as they nest in the mountainside. Out on the shoreline you will see Reynisdrangar, these rocky sea stacks were thought be trolls that were out in the ocean hunting for ships. Once dawn arose they were caught off guard and turned into solid stone. Upon visiting the beach you will observe rocky sea stacks known as Reynisdrangar sitting off the shoreline, . According to local Icelandic folklore, these large basalt columns were once trolls engaged in trying to pull ships from the ocean. However, as bad luck would have it, the dawn quickly arose, turning the trolls into solid stone. Just a few steps behind the basalt columns you will find a small cave, a great retreat if the waves comes too close or if it starts to rain. Be careful of the tide (sneaky waves) and mind warnings around the beach, since the ocean has been known to sweep people away if they aren’t too careful. This is a beautiful little fishing village, with only 300 inhabitants. it’s a small community but there are plenty of places for you to refuel. You can even pick up some handmade gifts. Starting off in Reykjavik from our Reykjavik terminal at Skógarhlíð 10 we will depart for Hvolsvöllur, a 1.5hr. ride. This will be a 15 minute pit stop to grab light refreshments and use the facilities. The first site along the tour is then Solheimajökull Glacier, a humbling glacial tongue extending from the Myrdalsjökull glacier. The next stop is Reynisfjara, the famous black sand beach with towering basalt columns, a basalt cave, and jagged lava pillars resembling petrified trolls. The lunch break with be at the small town of Vik, a cozy town with a typical Icelandic church overlooking the Atlantic Ocean. Skógafoss waterfall will be the next stop after lunch with a stairway leading up to a views of glaciers, black sand beaches, and epic mountains. The final stop will be Seljalandsfoss waterfall with a walkway leading behind the waterfall. From here, the journey back to reykjavik will be about 1.5hrs. This tour is 11 hours long including travel time and the time you spend at each location. You spend at least 45 minutes at the major stops giving you plenty of time to enjoy the nature and to take some photos. Please show up at our Reykjavik Terminal (located at Skógarhlíð 10) 15 minutes prior to the departure time. Please be ready at your pick up point with your voucher, either in digital or printed form. You will be traveling in a coach that holds approximately 40-65 people, but is very spacious and comfortable. There is no bathroom on the bus but there will be plenty of stops where facilities can be used. The bus offers free wifi and USB charging ports. Lunch is not included, but in Hvolsvöllur, Reynisfjara, and Vík there are shops where you can buy food and drinks. For the In-Bus-Audio-Guide: Bring your own headphones. Otherwise headphones are available for purchase in every bus from our hosts. For your comfort: Dress according to weather. In Iceland it is always wise to dress in warm waterproof clothes. Weather changes can be sudden so be prepared for all weather conditions. Waterproof jacket and pants, headwear and gloves, and warm socks/waterproof shoes are recommended.